Ever since publication of The Forgotten Seamstress, I have been learning more and more about the work of the thousands of wonderful quilters in the UK. 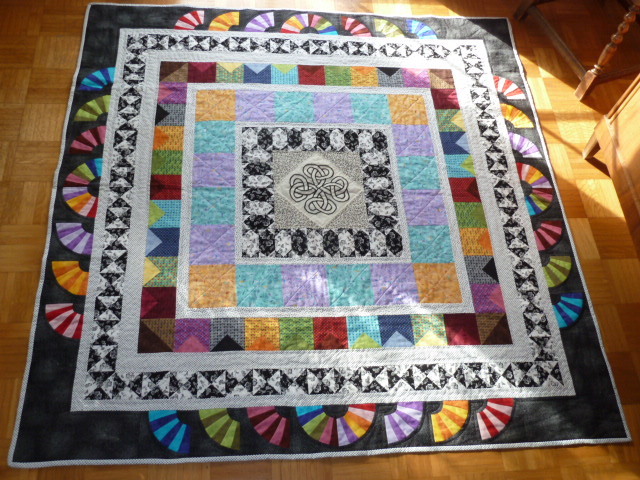 Some of them have used Lynne Edwards’ free pattern on this website to make their own interpretations of Maria’s Quilt. For photos of these beautiful quilts, see Bringing Maria’s Quilt to Life. Now, to my great excitement, The Forgotten Seamstress has been published in Germany, and I have received news of the first Maria’s Quilt made by a German seamstress. Here it is! I love the vibrant colours – many of them primary – set off by the bold black background. For me it is reminiscent of those wonderful German traditional costumes and other textiles. It feels quite Christmassy! Thank you so much to quilter Ingrid Müller and Wiebke Rossa, senior editor at my publishers Random House, for sending the photo. Now: a challenge to all you quilters in the United States: The Forgotten Seamstress has been published in your country for some months now, and I still haven’t heard about any American version of Maria’s Quilt! Please get quilting and send me your photos!